Dominik Biemann North Bohemia, Giant Mountains, ca 1825, Harrachsdorf (Harrachov) or Franzensbad (Františkovy lazne).Biedermeier period.Exceptional cup. Dominik Biemann North Bohemia, Giant Mountains, ca 1825, Harrachsdorf (Harrachov) or Franzensbad (Františkovy lazne). Biedermeier period. 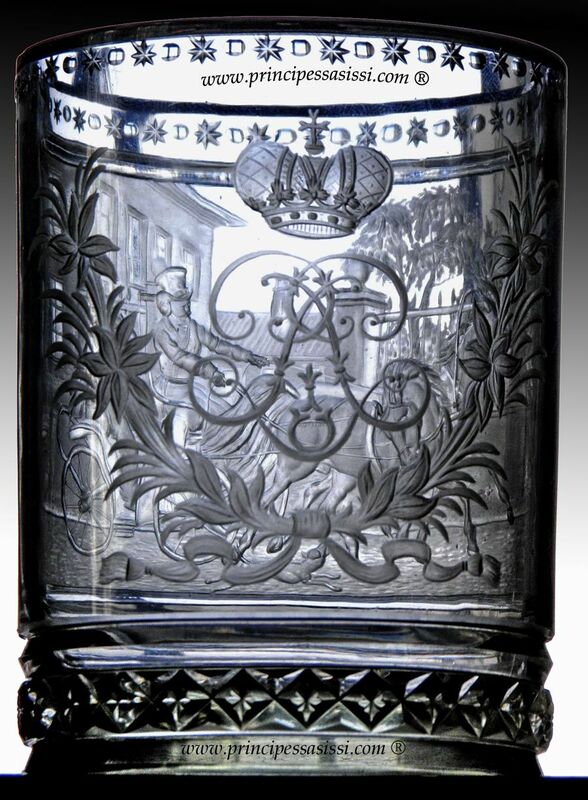 Exceptional glass in perfect condition attributed to the great Dominik Biemann, a work created for the commmittente, Tsar Alexander I of Russia (see Russian Imperial monogram with crown). High cm.11 larg.max. 8,3. The extraordinary quality of engraving. Admirable representation of the details (see, for. Example the windows of the building with the windows partially lit from the inside or the wall with bricks partly outcropping. Horses are ground with a poignant realism and the posture that almost makes them live ). Evident the hand of the great master, that has never been equaled by anyone in the art of glass in any country in the world and at any time.Dominik Bimann (or Biemann) (born on April 1. 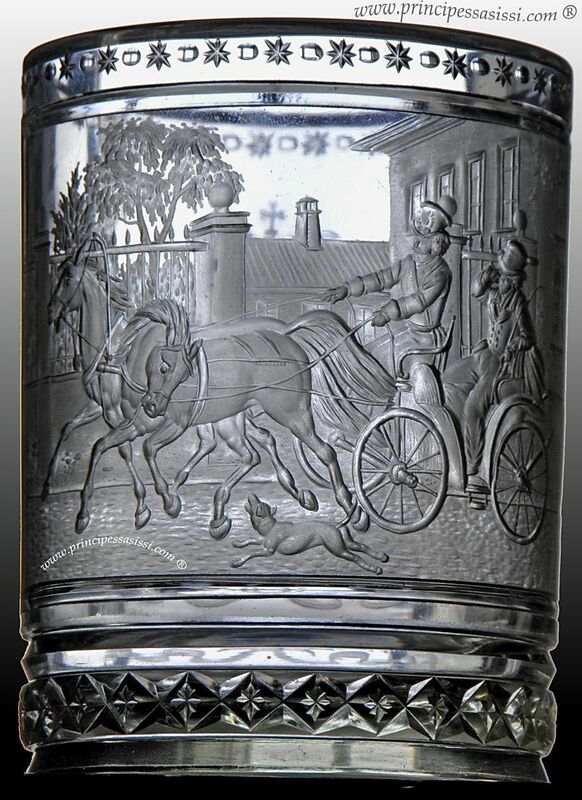 Neuwald 1800 (Neuwelt) at Harrachsdorf, who died on September 29., 1858 in Eger Cheb now) was the best engraver of glass ever lived. He continued the family tradition of glass making and learning the technique and the art by the great Franz Pohl. After attending art school he studied anatomy in Prague from 1826 to 1829 at the academy of fine arts. This explains his predilection for the busts and expressive human figures as much as possible. Later he started his own business in Prague.While initially worked on some simple crystal glasses and cups, began gradually to receive commissions from high procurement of complex jobs, such as a portrait of Goethe, his friend and Caspar Graf von Sternberg, a member of the nobility Bohemian . While the economy was growing and taking advantage of the time, Bimann moved in the summer of 1829 Franzensbad where they had some of the prestigious seat of Bohemian glass factories. There, he worked for clients of the spa aristocrats and the monarchy made mainly portraits on glass.He later moved to Vienna and Berlin to learn about the latest developments and trends in art. Bimann was a true artist of the Biedermeier period. In fact it was deeply rooted in the customs and tastes of his era. When in 1855 the fashion began to change his fortunes and artist together with the completely different world in which he lived vanished due to the spread of the industrial revolution, probably overcome by despair, he attempted suicide. For the consequences of such an attempt died three years later. Literature: Kurt Pitrrof, Dominik Biemann, Böhmischer Glasgraeur des Biedermeier Anorldosche (Germany). Das Glas Boemische Band II. Passauer Glasmuseum. Brosova Buqouy, Spiegl. 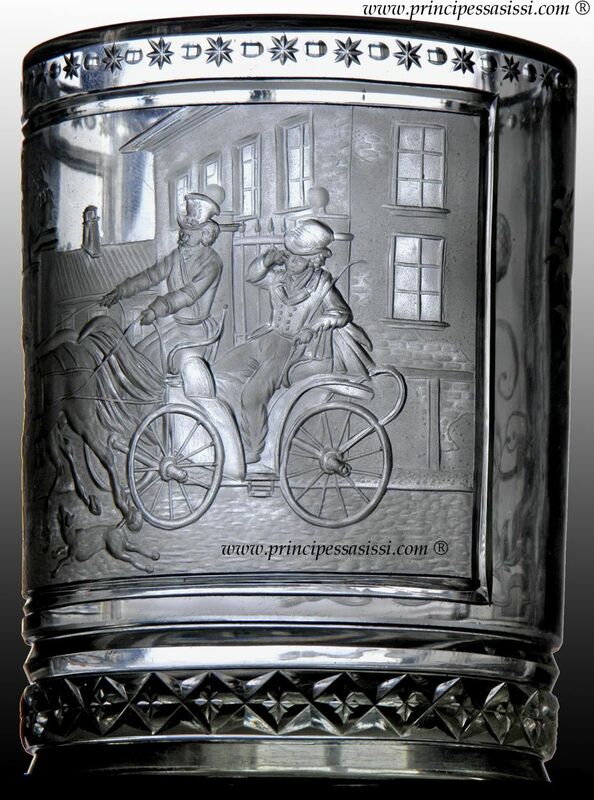 Gustav Pazaurek-Eugen von Philippovich, Glaeser Empir und der Biedermeierzeit, Klinkhardt Braunscheig.Pezatova Zuzana; Broch Jndrich Title: Bohemian Engraved Glass. Feltham, Hamlyn, 1968. 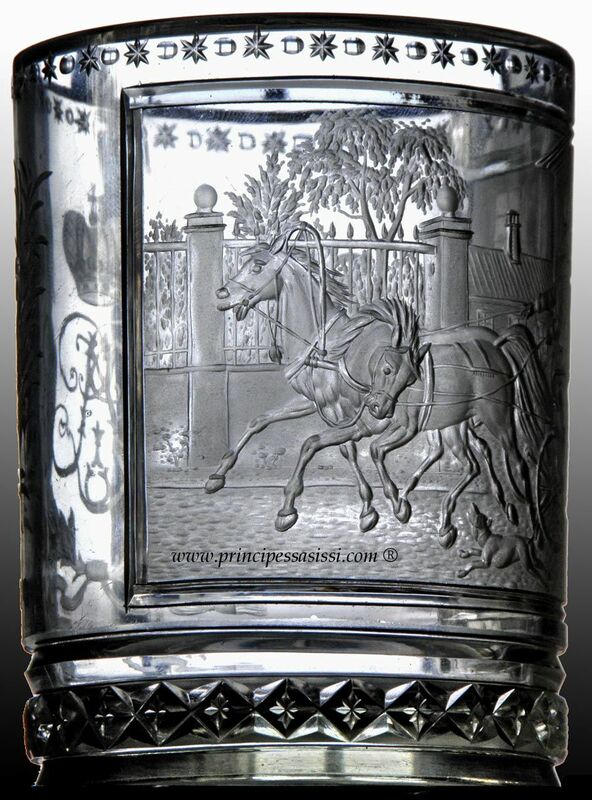 Paul von Lichtenberg, Glasgravuren Biedermeier Alexander I Pavlovich Romanov (Russian:????? I??????? ?, St. Petersburg, December 23, 1777 - Taganrog, 1st December 1825), known as Blessed, was Emperor of Russia from 23 March 1801 until his death. Alexander I was one of the most interesting figures of the nineteenth century. Autocrat and Jacobin, man of the world and mystic, he appears to his contemporaries as a riddle, that you can try to decipher, according to his own temperament. Napoleon refers to him calling him a cunning Byzantine, and calling it the Talma of the North, capable of playing any part. He was a liberal and enlightened ruler, the troubled period in which he lived, he saw the troubled Central Europe from the Napoleonic wars. Often stayed in Bohemia in the '20s of the century, particularly in the spa town of Karlovy Vary and in the city of Troppau (Sudetenland, north Moravia, Opava current), where in 1820 he met the Austrian Prince Clement von Metternicht to finish to bend its authoritarian politics. Visit www.principessasissi.com gallery virtual museum to learn about the masterpieces in glass Bohemian and Austrian / German Baroque, Empire and Biedermeier - the only sector in Italy and high specialization. Texts, images and literature available free of charge. The most detailed existing in Italy.